OLPC Oceania: "Let me add something raw and home based..."
"Let me add something raw and home based..."
"Let me add something raw and home based to my previous article ... yesterday. Patukae CHS is one of the OLPC projects project in the Solomon. While it is true that technology does not in itself responsible for driving change, it is a tool that can be used to drive change in learning and in commitment to learn. In for instance which is one of the pilots in the OLPC project we accepted OLPCs as tools and we invested efforts to make them work. "We ran training programme for teachers, and students, and we provided back-up support to both teachers and students and the results have been quite exciting. Student literacy rates have gone up. The overall academic performance of students with laptops had increased and we have seen increase in school pass rates since the introduction of laptops. The attitudes of students with laptops have changed; they are more active in their learning objectives. Parents have also becoming more engaged in their children’s learning and some of them have even improved their own English literacy through the use of the reading and pronunciation tools in the OLPC. 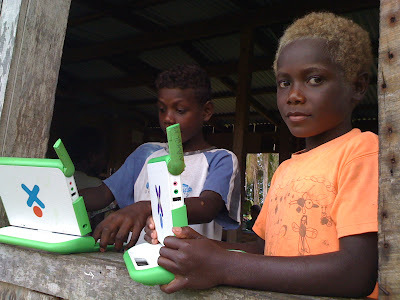 "We at Patukae College have definitely found the OLPC very useful. They have pushed the boundaries of Education, they have given teachers more option and ideas, and it has enabled students to learn in a different way. To make it work we took its vision, drive and commitment, and a belief that used properly, this tool can make the difference our rural schools are looking for. It is very easy to knock technology on the head, very easy to question its legitimacy, its usefulness, but let us not forget that we who can communicate are the lucky ones, we have the opportunity to have computers, they have helped us. For the first time similar opportunities are given to children in the rural areas at Patukae and they are now realising the same opportunities that some of us have been taking for granted. "In elevating this ICT innovation to another height, Patukae CHS in collaboration with most of the leading Primary Schools in Marovo Lagoon started last year and currently is through an UNESCO project launched a Marovo Wiki educator program that can globally accessed. Teachers from these schools were brought together to learn wiki skills to enable them use the skills in devising lessons both in English and in Marovo vernacular with the aim that most of these lessons should be uploaded to the Marovo Wiki/Wiki educator online. "This is ICT in action right in the classroom and our teachers and students used the OLPC to make this work. With the introduction of OLPC into its classroom, Patukae see opportunities through the challenges and decided to move on realising the potential ICT can bring to its populace. In that view point I would call on for more support towards ICT expansion in Schools. Let us not criticise the technology, nor those that are trying to help. But rather ask the question, what can I do to add value to this initiative. At Patukae we take the view that we need to empower our teachers so that they in turn can empower our students. There is no point always looking at the empty portion of the ‘half-filled bucket of water’; rather we should be asking the question, how can I fill the rest of this bucket of water so that can achieve its full potential? "I support the OLPC programme and what it sets out to do. I have seen the benefits it has provided to those that have received it. It is my hope countries can put in place mechanisms that will empower teachers to empower children but also processes that will objectively evaluate the impact of this technology in the education of our children into the future because the outcome of such evaluations will add more weight to the effectiveness of OLPCs as an effective learning and communication tool..."